I had my op on Tuesday and it ended up being a bigger procedure than both the doctor and I had anticipated so instead of being released on Tuesday evening, I was only discharged yesterday. I finished my book early on Wednesday morning and then talked the ears off my neighbour, sent text messages to Dion and other friends, checked my Google Reader until my laptop died (they had no adaptor so I couldn't plug in), watched TV, etc, etc. I was on a clear liquids diet on Wednesday (apple juice and "soup" (salty water!)) and transitioned to a mixed liquids diet on Thursday (yoghurt, tropical fruit juice, Ensure nutritional drink, smoothies). Cleared my Google Reader, replied to emails, sent email to my list, etc, etc. 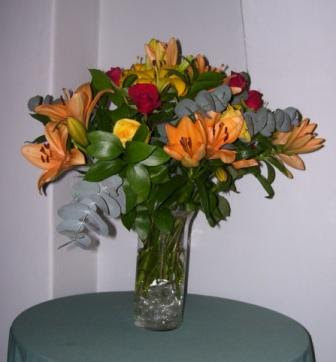 I also had lots of phone calls, three visitors and the beautiful bunch of flowers (see the picture above). And then on Friday, I was discharged - yayyyyy - and left the warm hospital to an ice-cold and absolutely freezing Johannesburg. Brrrr! I must say, the nurses, doctors and staff were all WONDERFUL but still, it is good to be home! I'm not fond of hospitals either!